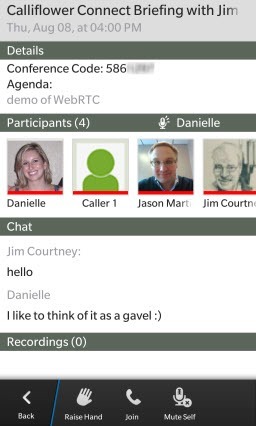 Voice conferencing provide Calliflower delivers a new user interface that takes full advantage of WebRTC and the superwideband Opus audio codec to deliver a simple, robust, crystal clear and reliable moderator and participant experience. 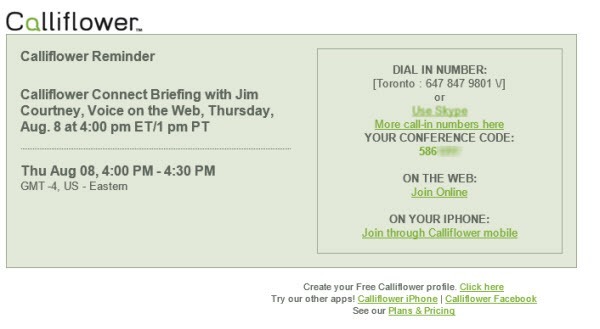 It’s been over two years since covering Calliflower, a worldwide voice conferencing service which I had frequently been using up to then. In the interim founder Alec Saunders took on the challenge of building BlackBerry’s Developer Relations program (now with over 120,00 applications) and Jason Martin took over as CEO of iotum, Calliflower’s business entity. Alec remains a member of iotum’s Board. Jason and his team have not exactly been idling in the interim. They have been bringing in new customers, including a couple of larger enterprises, and servicing small-to-medium businesses while also serving as a resource for special interest groups and non-profits that may want to meet up regularly. Some use it for revenue generating services such as coaching, training and other professional services. And they have been working on a totally new user interface. As background recall that iotum’s goal for CalliFlower has been, and remains, to provide a complete end-to-end conferencing service from participant invitations and scheduling through to a recording archive, incorporating voice, chat and document sharing. But it’s the user interface that has changed significantly. Their product management and developer team has been listening to feedback from their users and watching the evolution of new technologies. As a result two weeks ago iotum announced an entirely new, easy to navigate, Calliflower user interface. Invite participants from your Address book and send out the call information via email, chat or SMS text messaging. ensure your have your headphones on or an available mic/speaker and click on the Call Now button! Voilà – I was on the call with the full portal in view on my browser, shown above. And the voice quality was crystal clear; it turns out that Calliflower is using the superwideband, royalty-free Opus audio codec. No special setup was required; no software to install; no number to dial, just a simple click-to-call. 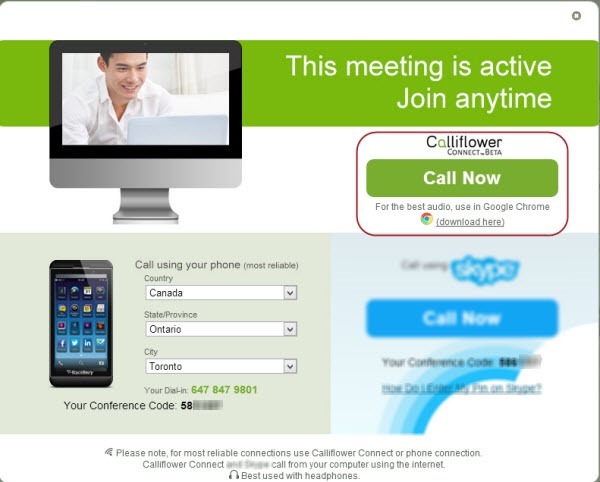 Development of Calliflower Connect took over six months with the goals of optimizing call quality, ensuring audio synchronization within a conference call and designing an appropriate web user interface. Calliflower has three levels of security. Calls may be open, closed or locked down. Closed calls require a PIN or a registered Caller ID (in my case my legacy CallerID registration was still active); locked down calls involve the combination of a PIN number and a conference code; the latter is commonly requested by users in the finance, legal or even political space. Your callers can dial-in with their phones OR use their browser (we call it ‘Calliflower Connect’) OR use Skype. We recommend using your phone or Calliflower Connect because it’s technology we can control. Skype can be unreliable. Meeting set up can also be done from the various mobile device applications. In response to user experiences and requirements, Calliflower has established new monthly subscription options in addition to a Pay-As-You-Go option. Minutes are counted as length of session time times the number of participants, regardless of the actual connection. Bottom line: Calliflower remains a viable consideration when looking at teleconferencing services. Ease of setup, a single user interface, “who’s speaking” identification, chat, document sharing and recording/archiving all contribute to its completeness. 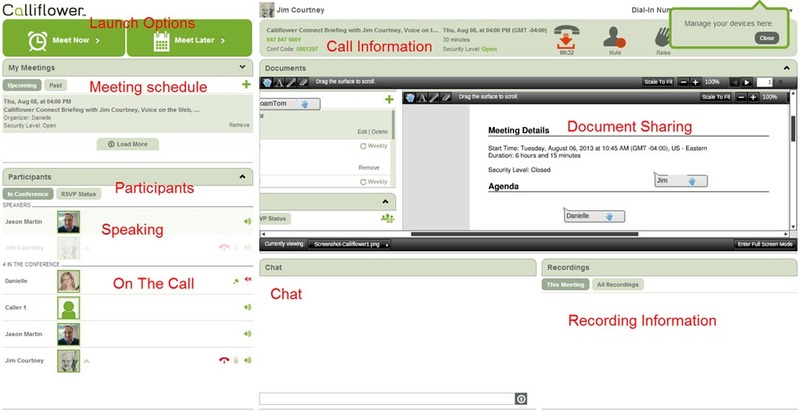 Adding in crystal clear voice (when connecting via the web) and moderator call control tools (such as hand raising and user mic muting) results in a significantly easier offering for those businesses and special interest groups who have to meet often, securely and in a way that ensures participants clearly hear every word. Document sharing and chat, with the ability to include active URL’s, complement the real time conversation with appropriate support tools. In summary, you do not need to be a technophobe to set up or participate in meetings. Just as importantly my interview call with Jason Martin was my first experience using WebRTC from a user perspective and my first experience with the Opus superwideband codec. The combination demonstrates how easily launching conversations can be embedded into the web and how readily one can have the experience of crystal clear voice using the new Opus audio codec.